If a member museum, as a result of its continuing research, gains information that establishes another party’s right to ownership of a work, the museum should bring this information to the attention of the party, and if the case warrants, initiate the return of the work to that party, as has been done in the past. In the event that a third party brings to the attention of a member museum information supporting the party’s claim to a work, the museum should respond promptly and responsibly and take whatever steps are necessary to address this claim, including, if warranted, returning the work, as has been done in the past. The Stanford Archaeology Center has published an image of the Saqqara register apparently showing the mummy mask. It is therefore appropriate to consider Zahi Hawass' claim, rehearsed so clearly in The Riverfront Times in 2006 [see here]. The AAMD Guidelines do not suggest that there should be a limitation on claims. Indeed the Guidelines suggest that AAMD member institutions should have the highest standards of acquistion policies. Kaywin Feldman, president of the Association of Art Museum Directors and director of the Minneapolis Institute of Art, recently raised the issue in a recent letter to the New York Times (see here). She claimed that members of the AAMD "subscribe to the highest principles of collecting and stewardship of their collections". SLAM's decision to initiate legal action over the mask appears to fly in the face of the AAMD's position. Member museums should thoroughly research the ownership history of archaeological materials or works of ancient art (individually a “work”) prior to their acquisition, including making a rigorous effort to obtain accurate written documentation with respect to their history, including import and export documents. 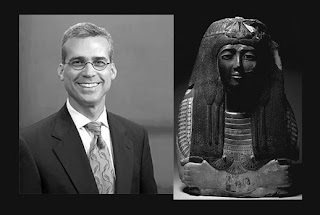 The St Louis Art Museum's efforts of due diligence inquiry prior to purchase of the Ka-Nefer-Nefer mummy mask are criticized in this research since minimal efforts were taken to establish the facts of the case, particularly in identifying the source and history of the object prior to purchase. It will be interesting to see if the AAMD speaks out in support of SLAM or if there will be moves to encourage the museum back into negotiations with Egypt's archaeological authorities. The alternative is that SLAM publishes the "accurate written documentation" relating to the collecting history ("provenance") of the mask. I hope SLAM does not make the argument, much beloved by retentionists in the Western world, that there has not been any formal or official demand for the sculpture. The Germans have presented such an argument in the case of Nefertiti, the British in the case of the Rosetta stone and the Austrians in the case of Montezuma’s Crown.